Milton Babbitt’s Transfigured Notes for string orchestra had a ‘sensational’ career before it was ever actually performed, having been declared “unplayable” twice by a major American orchestra. That it is eminently playable is demonstrated by this first recording, made live at Gunther Schuller’s world premiere performance. 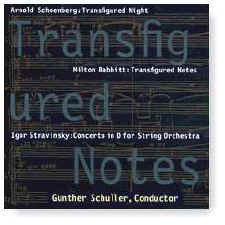 Transfigured Notes is embraced on this CD by seminal works by Babbitt’s two favorite composers: Schoenberg’s early masterpiece Transfigured Night and Stravinsky’s Concerto in D for String Orchestra. Performed by a string orchestra handpicked from among Boston’s finest musicians and recorded live at Jordan Hall, Boston, February 1991. Recorded 8-9 February 1991 in Jordan Hall at the New England Conservatory in Boston, Massachusetts.